There are a lot of stocks out there to buy, over 6,000 actually. There are 3,190 companies’ common stocks that are traded on the New York Stock Exchange. And, another 3,000 stocks are traded on the Nasdaq and American Stock Exchange. So, how do you go about finding those diamonds in the rough? How do you separate the wheat from the chaff? Stock Screeners. I like to find new stocks to consider buying through an online stock screener. I personally use the Yahoo Finance and Google Finance stock screeners. Yahoo Finance lets you input several key attributes that you are looking for in a stock in to the online computer program. You can reduce the number of companies by looking for specific ranges of share price, market capitalization, dividend yield, beta, revenue, industry, profit, earnings growth, and a host of other metrics. The stock screener program on the websites then whittles the universe of 6,000 stocks down to a manageable list of ten to twenty that will enable you to conduct more in-depth research. The Google stock screener lets you use sliding bar graphs to trim the number of stocks you are looking for based on the criteria. I especially like that Google Finance’s stock screener lets you compare companies that have been recently beaten up in the market. I routinely look for companies that are off of their 52-week high price in the hopes that they will once again return to those highs of their stock price. Example. 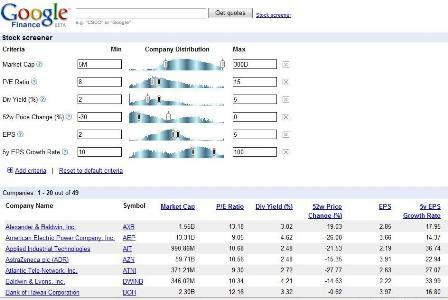 I used these inputs to drawdown the list of stocks and find some good companies to invest in. In Google Finance, I entered: market capitalization between five million and 300 billion, P/E ratio between 8 and 15, dividend yield between 2 and 5%, a 30% drop from their 52-week high, earnings per share (EPS) of between $2 and $5, and earnings per share growth rate of between 10% and 100% for the past year. Results. I ended up with 49 stocks to choose from. As I look through the names of the companies, I am personally biased and quickly eliminate all financial stocks, automobile makers, and airlines from the list. I am left with several companies that I have heard of such as Barnes and Noble Bookstores (Stock Symbol: BKS), Northrop Grumman Corp (NOC), Raytheon (RTN), SCANA (SCG), Snap-On (SNA), and Sherwin-Williams Company (SHW). And, the list also contains a few new companies that I am not very familiar with such as Herbalife (HLF), Alexander and Baldwin, Inc (AXB), and Brady Corporation (BRC). That is the entire point of this exercise after all. It is often very hard to find new stocks to research before buying. Stock screeners like this are a great tool to help you narrow your choices and focus your limited research time before investing. Disclaimer: I do not own any of the stocks listed above, and everyone should conduct their own research before investing anything in a stock. If you are looking for some good guidelines on stock attributes, I think that you might like the six part series I recently wrote on what to look for in a good individual stock to buy.